Nigerian winger Victor Moses was the hero, scoring the winner as Chelsea stormed back from behind to end Tottenham Hotspur’s unbeaten Premier League record with a 2-1 victory at Stamford Bridge yesterday. The win propelled Antonio Conte’s soaring side back into top spot. “This is my club. The manager gave me the opportunity to express myself and I’m pleased with how I’m doing,” Moses declared after the 2-1 win over Spurs. His goal against Spurs on was his third and all three goals have come at Stamford Bridge. He was man of the match as Chelsea beat Middlesbrough last weekend and he was also picked as the top performer against Spurs. 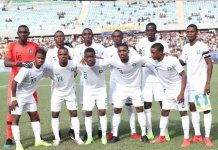 Chelsea manager Antonio Conte has already said he is shocked that despite his talent, the Nigeria star has been shipped out several times on loan by ‘The Blues’. 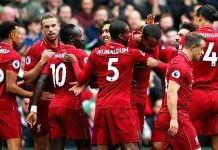 Chelsea had seen Liverpool and Manchester City steal past them earlier in the day and fell behind in the 11th minute when Christian Eriksen became the first player to score past them in seven games. But Pedro Rodriguez’s glorious curler and a Victor Moses tap-in either side of half-time gave Chelsea a seventh successive win — their longest such run within one season since January to April 2007. Chelsea, who visit City next weekend, restored a one-point advantage over second-place Liverpool and left London rivals Tottenham seven points below them in fifth place. It marked a rotten end to a disappointing week for Spurs, who were knocked out of the Champions League by Monaco in mid-week and have won only one of their last 10 fixtures in all competitions. Their run of games without victory at Stamford Bridge, where their title challenge last season ended in May, now stands at 30, their last victory there having come in February 1990. Missing Toby Alderweireld and Danny Rose, Spurs were patched up at the back, where centre-back Kevin Wimmer filled in at left-back and Eric Dier partnered Jan Vertonghen in the centre. But the return to a 4-2-3-1 formation, after dalliances with a back three and a 4-3-2-1 system, helped them get their press in order and they had Chelsea on the back foot in the first half. After a couple of early threats, including a Harry Kane effort that was chalked off for offside, Mauricio Pochettino’s men took the lead with a fine goal. Breaking from midfield, Dele Alli toed the ball to Eriksen and from outside the box the Dane let fly with a vicious left-foot shot that soared past Thibaut Courtois’ outstretched right hand. It was the first goal Chelsea — unchanged for the sixth game running — had conceded in 601 minutes of football, since a 3-0 defeat at Arsenal on 24 September. 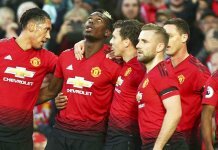 The visitors were playing with an intensity last seen in their impressive 2-0 win over Manchester City in early October and their rediscovered confidence was expressed by their willingness to shoot. Victor Wanyama, Kane, Eriksen and Mousa Dembele all chanced their arm from range, although only Kane worked Courtois. The Chelsea goalkeeper also had to save from Kyle Walker after the England right-back had lifted the ball over Marcos Alonso and tried his luck from an angle. Chelsea’s initial efforts to respond, via a David Luiz free-kick and an Eden Hazard shot, were comfortably held by Hugo Lloris. But on the stroke of half-time Pedro levelled with a magnificent goal, deftly turning and then wrapping his right foot around the ball to send it curling inside the right-hand upright. N’Golo Kante signalled Chelsea’s second-half intent by ramming a shot at Lloris and within six minutes of the restart, they were in front. Diego Costa was the architect, working his way to the byline on the left and crossing low for Moses, whose shot flicked off Lloris’s right boot, struck Vertonghen’s knee and ricocheted into the net. Marcos Alonso should have made it 3-1 shortly after, following more byline burrowing by Costa, but from 10 yards out the Spaniard ballooned a shot over the bar with his weaker right foot. Kane created a chance for Eriksen to equalise, but the Spurs number 10 could only volley straight at Courtois as the last unbeaten team in the division finally succumbed to defeat on their 13th outing.